On a more positive side, this category serves up a rather interesting geographic distribution. Three of the composers are French (Olivier Messiaen, Henri Tomasi, and André Jolivet), three are Finnish (Magnus Lindberg, Kaija Saariaho, and Salonen himself), two are Eastern European, (Witold Lutosławski from Poland, and György Ligeti from Hungary), and one is Japanese (Toru Takemitsu). Where specific compositions are concerned, I have to say that I have several pangs of dissatisfaction. Whether these had to do with Salonen, the record producers with whom he worked, or some combination of the two is unknown to me; but I am relatively confident that most, if not all, of my quibbles would not likely mean very much to anyone whose priority had to do with marketing! The most significant of those missed opportunities involves the ondes Martenot. Messiaen took a great interest in this instrument; and it figures significantly in the performance of his “Turangalîla-Symphonie,” which is given an impressive account by the recording in this collection. One of the first virtuoso performers on this instrument was Jeanne Loriod, Messiaen’s sister-in-law; and, according to her obituary in The New York Times, she estimated that fifteen concertos had been written for the instrument. These are not enumerated on the instrument’s Wikipedia page; but I know that, in my personal history of collecting recordings, I only encountered one of those concertos, which was composed by André Jolivet, who happens to be the only concerto composer named explicitly on that Wikipedia page. 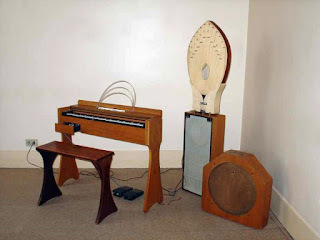 I suspect that anyone curious about this instrument would have benefitted from the opportunity to “compare and contrast” Messiaen’s approach to this instrument with Jolivet’s. Alas, Jolivet only appears on a recording of trumpet concertos featuring Wynton Marsalis as soloist, where it is coupled with a concerto by Henri Tomasi. The good news is that the concertos on the vinyl album I had collected are now available in CD form on a release by disques Adès. The other good news is that the other Messiaen selections that Salonen recorded are as impressive as “Turangalîla,” particularly when there is solo piano work being performed by Paul Crossley. Another instrumental soloist who endows this particular category with considerable life is Finnish cellist Anssi Karttunen. He appears on each of the three CDs for each of the Finnish composers in the collection. All three of those composers are capable of taking rather thorny approaches to their emancipated dissonances, but there is so much energy and lyricism in Karttunen’s performing technique that one can take in the full scope of each of the compositions without things every feeling too prickly. Where Lutosławski is concerned, I appreciate that Salonen took the trouble to record all four of his symphonies; but I must confess that I have yet to get my head around any of them. Personally, my most significant discovery in the Lutosławski repertoire was my first encounter with music that made it clear that he had a sense of humor. Fortunately, that side of him appears on one of the CDs with his song cycle Chantefleurs et Chantefables, which the track listing translates as “songflowers and songfables.” These are given a delightful account by soprano Dawn Upshaw, and these are the tracks that give me the most satisfaction. On the other hand, just as the role of Jolivet seems to have been to support Marsalis, the Takemitsu album seems to have been conceived to promote guitarist John Williams. Yes, Takemitsu took a great interest in the guitar; and I definitely enjoy the inclusion of “Toward the Sea” on this disc, even if Salonen had no hand in it, since it is a duo for alto flute (Sebastian Bell) and guitar. On the other hand Takemitsu’s arrangements of popular songs for solo guitar tend to exceed my tolerance for sugar overload, even if they make for perfectly nice encore selections at a solo guitar recital. From a historical point of view, all of the composers represented in this category have much to offer adventurous listeners. Unfortunately, market forces seem to have smoothed over many of the rough spots that make the listening so adventurous. There are definitely better selections that will give the seriously adventurous listener a better sense of what made the second half of the twentieth century such an adventurous time.